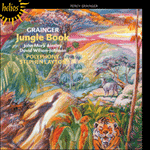 Early one morning, edited by David Tall for large mixed chorus, incorporates Grainger’s early vocal settings as verses two and three. It has been seen that it was Grainger’s habit to return to his manuscripts over the years, extending songs with new verses, adding richer harmonies, changing instrumentations for special occasions or sometimes just adding small details to material that did not satisfy him. He originally set this traditional folk-song when sixteen years old as a single verse for voice and piano. On 16 October 1901 he modified this setting in a sketch for mezzo soprano and three altos and added a newly composed verse for mezzo soprano and male voice choir. The metamorphosis of this work continued throughout the years and finally, in 1950, he responded to a request from Leopold Stokowski and transcribed it for full orchestra. This version uses choral techniques pioneered by Grainger with the unison singing of the melody (soloists in this recording) being accompanied by a small chorus singing in harmony. The last verse makes use of the harmonies Grainger introduced in his 1940 transcription for soprano solo and piano. I heard a maid sing in the valley below. Remember the bow’r where you vowed [promised] to be true.